Off to the dizzy heights of Hawes! 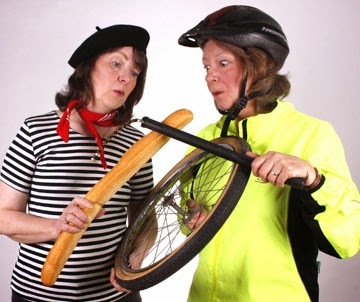 This will be our last public outing of the year (but have props, will travel), featuring our modest but highly acclaimed Tour de France adventure, and the funny yet moving "Photographing Kites" One Act Play. So if you've always wanted to know what on earth the fuss is about but never got round to finding out, now's your chance! There are plenty of outlets in Hawes to get your tickets - click here for details. There are a limited number of tickets available at Crossleigh Stores in Austwick. If you live in the Austwick-Settle area and would like a lift, or have a spare place in your car let us know and we'll introduce you! And what a treat awaits you! Laugh-out loud comedy and moving drama - that's what it says on our business cards, and we don't disappoint! The Tour de France may have been and gone but we've still been honing our cycling technique, increasing the cushioning on the saddles daily. We promise you a wallow in the wonderful memory of that sunny day in July and Lippy Logic's conquest of the Cote de Buttertubs . "...first class entertainment. 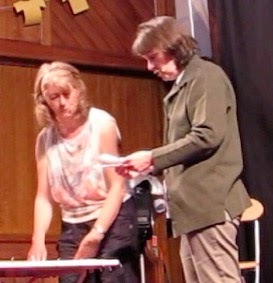 It was punchy, uplifting, funny and really got the audience involved. Your timing throughout, was excellent. Everyone came away laughing, which speaks volumes"
Our drama item "Photographing Kites" brought laughter and tears (in the right places!) "...whilst we’d been warned that it dealt with difficult subject matter, nothing could prepare the audience for the emotional punch as Gill and Sally’s story was revealed" It's funny, tender and sad. 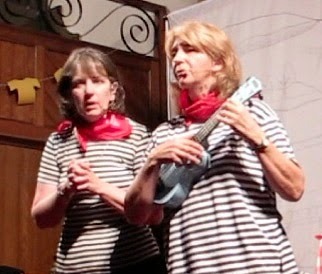 And then there'll be the Wensleydale Premiere of the Lippy Logic Signature Tune which everyone can join in with gusto (bring your ouwn ukulele if you must)!